← Nesting highs and woes ….. 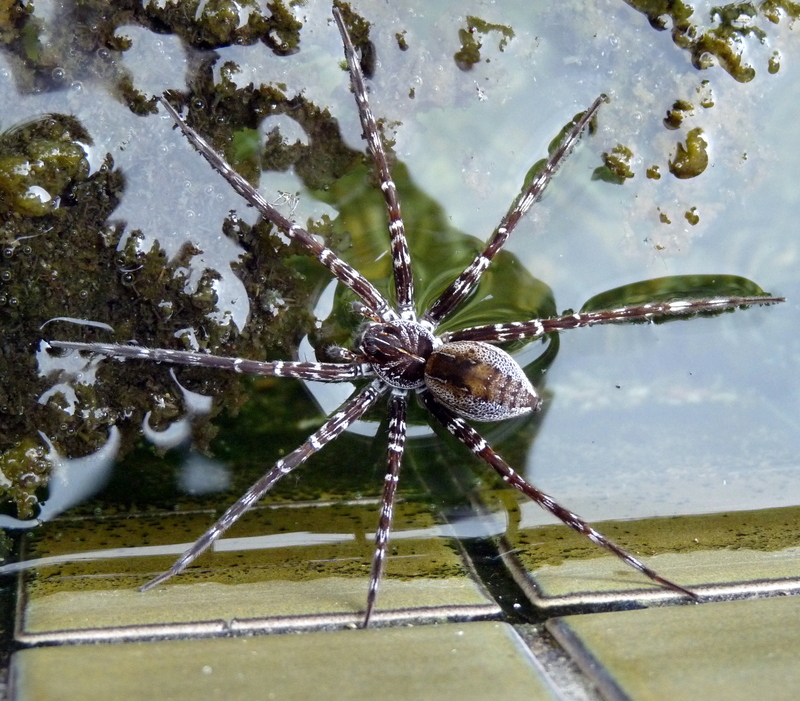 Recently, while cooling off in our natural swimming pond, I noticed a spider on the water’s edge. When I attempted to get close for a better look it ran away on the water and then went under the surface where it remained quite stationary on the tiles for several minutes. I returned to the pool several times with the camera before I managed to get this photo but unfortunately from that angle I couldn’t get a good view of the eye arrangement. POST UPDATE: click to enlarge photo for clear image of eyes. Our attempts at identification were unconfirmed until we just happened to have a spider enthusiast visit us a couple of days ago. 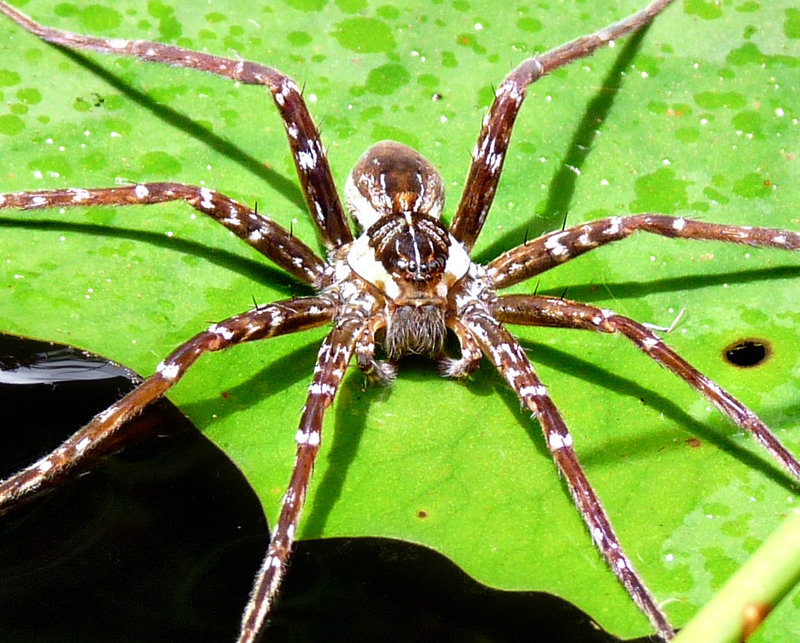 Although unable to identify the species from the photo Greg was confident that the spider belonged to Dolomedes, a genus in the family Pisauridae, which is the nursery-web or water spider family. The female nursery-web spider carries her egg sac beneath her. Just prior to the eggs hatching she constructs a silken brood chamber, often suspended between reeds, where she guards her offspring until they are independent. 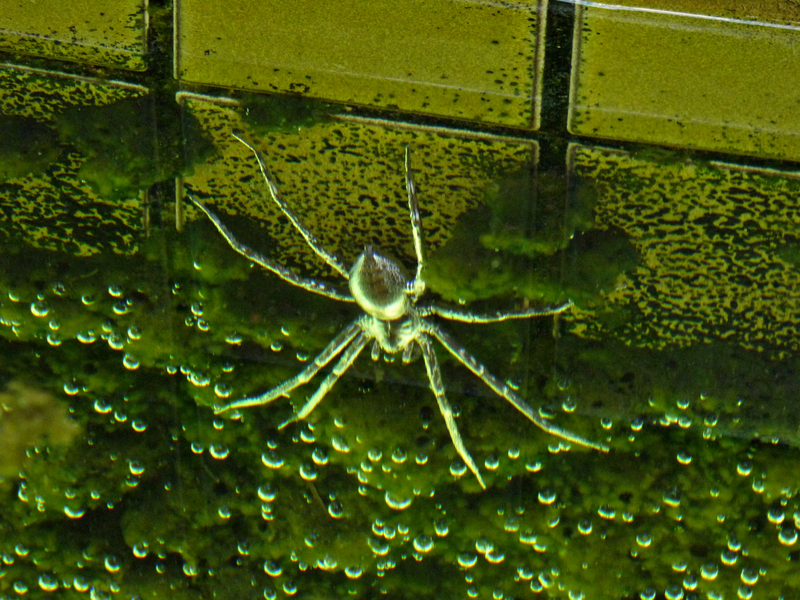 This photo shows the spider under water, not a clear shot but it does illustrate the spider’s position, the water surface is in the top right-hand corner. And to give you some idea of its size the tiles are approximately 50mm square. The last photo shows a different and more common Dolomedes which has found the environment of our natural swimming pond very suitable judging by the numbers of young I have observed. While the conversion of our regular inground swimming pool to a natural pool is probably not everyone’s dream….it is an interesting environmentally friendly project and I’m going to write more about it very soon! 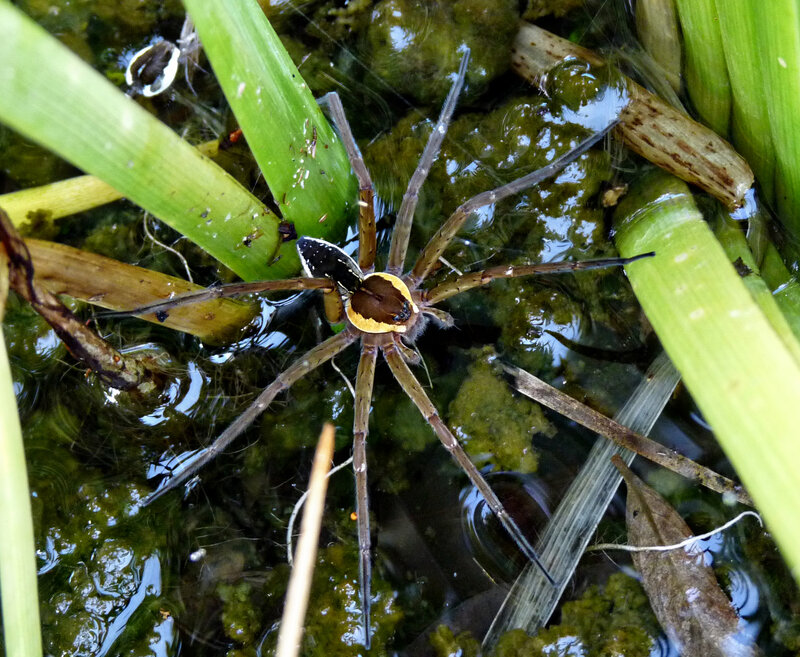 This entry was posted in Pond Life, Spiders and tagged Dolomedes, Nursery-web Spiders. Bookmark the permalink. Nice images show the depression made by the feet. It always amazes me that they can use the “surface tension” of the water like that, not pierce the surface of the water. And a Happy New Year to you too Denis. According to Bert Brunet’s notes in “Spider Watch” the feet have special hairs for walking on water surfaces – quite fascinating. There is always something new to learn in nature!